p r e s e n t s Th e M Rep o RT | 33 Origination Guide In today's high-tech lending environment, the nation's top originators are looking for processes, tools, and partners to streamline the origination process. 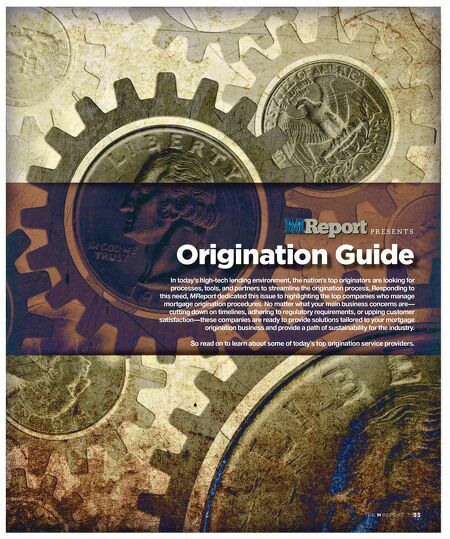 Responding to this need, MReport dedicated this issue to highlighting the top companies who manage mortgage origination procedures. No matter what your main business concerns are— cutting down on timelines, adhering to regulatory requirements, or upping customer satisfaction—these companies are ready to provide solutions tailored to your mortgage origination business and provide a path of sustainability for the industry. So read on to learn about some of today's top origination service providers.